Back in January 2018, just weeks ahead of the infamous VIXtermination event on Feb. 5 2018 that wiped out virtually all inverse VIX ETPs in seconds, we predicted that such an event was imminent as a result of a sharp spike in the total outstanding Vega across the entire levered and inverse volatility derivative space, which had reached an all time high. 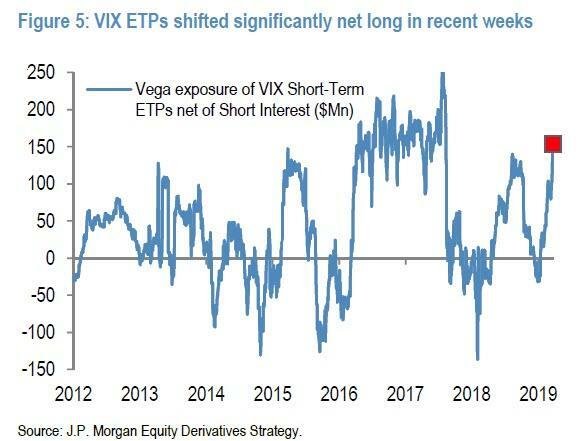 Since then, while the VIX ETP market had been relatively quiet as a result of last year’s fireworks which wiped out countless retail investors and other vol sellers, another VIX “event” is coming, and it will be the result of a silent war being waged between retail and institutional investors. However, when it comes to asset flows in 2019 – which has seen the S&P rise back to all time highs even as equity investors have been pulling money from equity funds week after week – here too the situation is not nearly as simple. 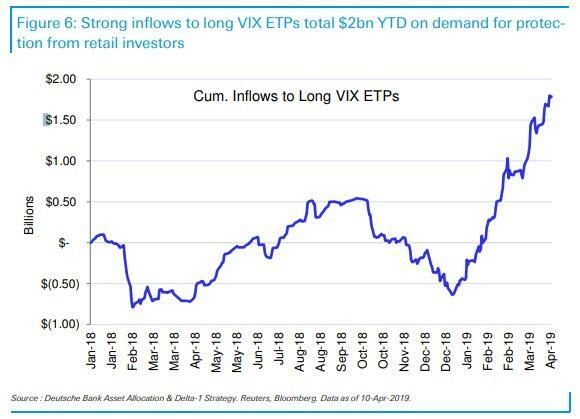 Commenting on the latest VIX flows, Deutsche Bank’s Parag Thatte reiterates JPMorgan’s point, observing that long VIX ETPs have seen significant inflows totaling $ 2bn YTD, as retail investors hedge equity gains. 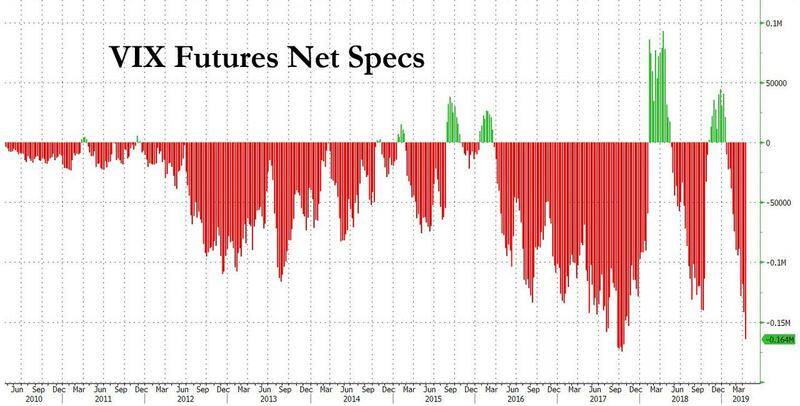 This record inflow into VIX ETPs, amounting to $ 2 billion in notional, is shown on the chart below. If one believes institutions, one look at the chart above confirms that not only is market complacency greater than its was either ahead of the Q4 mini bear market and February 2018 Volmageddon, but it is just shy of a record. And so the question emerges: who is right – retail investors, who are not only pulling billions from equity funds but have pushed their crash bets to all time highs via VIX ETPs, or institutions, who oddly are on the other end of the spectrum, and not are complacent to an almost record degree, but in their pursuit of yield and carry trades have pushed the net VIX futs short position to unprecedented levels. 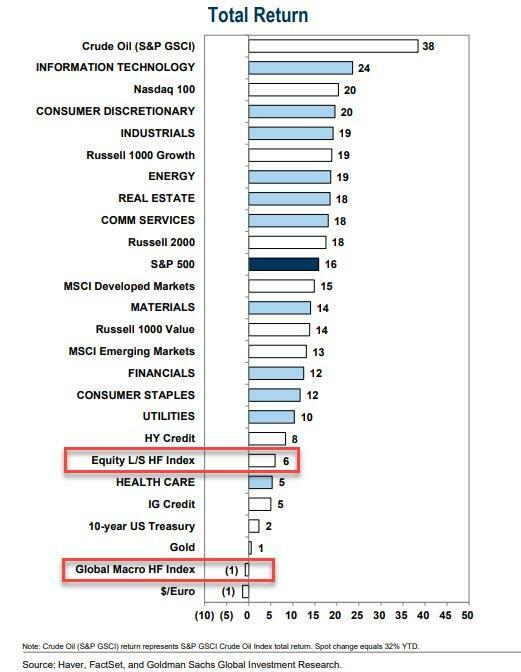 And while conventional wisdom would say that institutions, i.e., the smart money is always right, for the 9th year in a row, hedge funds and their peers are underperforming the market (with macro funds getting demolished once again). So who will be right – retail or institutions. Since both positions are at or near record levels, the answer should emerge in the very near future.